Cornwall's Sammie Giles has won the English Women's Open strokeplay title. The 20-year-old, who plays at the St Mellion club, holed a 15-foot birdie at the final hole to win by one shot from Yorkshire's Rochelle Morris at St Annes Old Links near Blackpool. 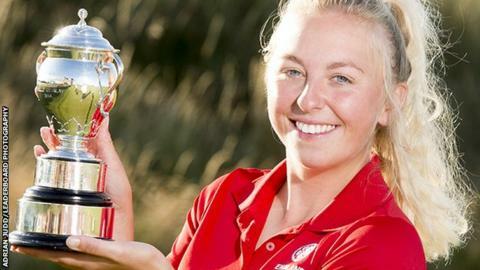 It is Giles' second national title following her win at the 2014 English mid-amateur championship. "It's nice to win a strokeplay event because that's what I want to do in the future," she told BBC Radio Cornwall. "I'd really love to play on tour one day, that's definitely my aim. The LPGA is everybody's dream."